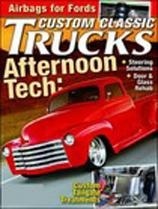 Custom Classic Trucks Magazine focuses on cosmetic and performance restoration of American-manufactured vintage pickups, panels, and deliveries through 1977. Custom Classic Trucks provides extensive coverage of parts and services. Custom Classic Trucks is the only publication that speaks to both rodders and hard-core truck builders.